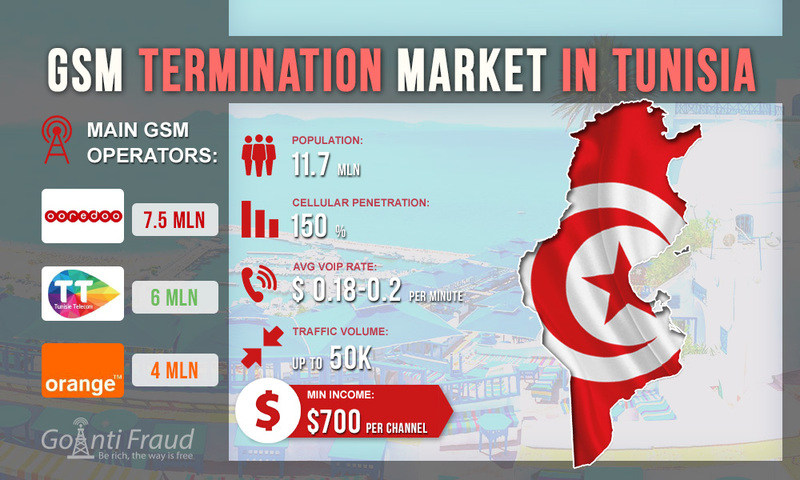 Tunisia, as an African country with a developed GSM market, can become a profitable direction for making money on termination. Mobile penetration in Tunisia is one of the highest in North Africa (about 17.5 million connections). The average rate being $0.18- $0.2 per minute. Tunisia is a profitable place to start a traffic termination business, if you use an effective anti-block solution. Orange (marking share — 23%). Ooredoo and Tunisie Telecom provide GSM coverage of equal quality (coverage - 99%). Orange has a slightly worse network - it covers 87% of the population. There are also MVNO (virtual mobile operators) in the country: Lycamobile, Wantany Telecom. To purchase a prepaid SIM card, you need to show your passport at the point of sale, for its subsequent registration. It is clear that this option is not suitable for termination. Therefore, look for SIM cards from the street vendors (already registered in someone's name) or on dedicated online forums. Starting plans can cost from 30 cents to 3.5 dollars in Tunisia, often with initial loans or bonuses. The prices for outgoing cellular communication are also minimal - from $ 0.01 per minute. If you run the gsm voip gateway amazon for 5 hours a day, your minimum profit will be $700 from each port.